This is an update on Shannon Loughnane's Extremely Long Walk to Canberra and his visit to Benalla on Saturday April 27th. On the morning of Shannon’s arrival we are having a stall at the Lakeside Market from 9.00am until 1.00pm to collect signatures for Shannon’s petition to Parliament, and to display BSFG and REB information. Mayor Scott Upston will attend a Welcome event for Shannon at the John Cooper Hall, the Benalla Uniting Church from 4.00pm. At this event we will hear from Shannon about his project and also John Lloyd who will talk about local climate change actions and renewable energy developments, and hear from other people about local climate actions. Finger Food and Tea/Coffee will be available at this event. BSFG acknowledges a Benalla Rural City Sponsorship Grant which is supporting this event. Shannon is inviting people to walk with him. A good way to follow and join his walk is through social media. The attached flyer also has live links to Facebook, twitter and Instagram. While Shannon would appreciate your company on his walk he is particularly interested in getting your signature on his petition. The opportunity to do this in Benalla will be at our Lakeside Market stall from 9.00am to 1.00pm or the Welcome event at the Uniting Church from 4.00pm. The Food Co-op also has the petition if you wish to sign it on one of the shops open days. One of our members is hosting Shannon on Saturday night before he continues his walk to Wangaratta on Sunday. Peter Maddock Secretary 0418 135 330. 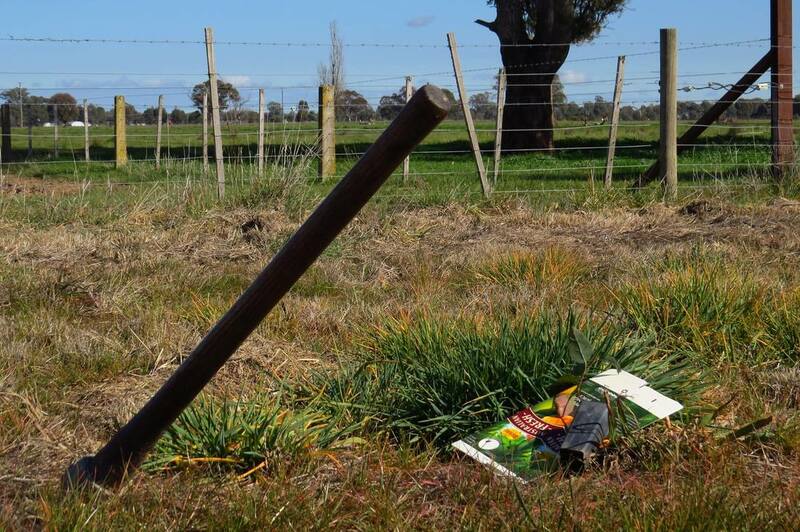 Recently Shannon Loughnane of My Extremely Long Walk for Climate Action contacted the Benalla Sustainable Future Group seeking support on his walk from North Coburg to Canberra from April 20 to May 14 2019. Described as a Low-Carbon, Community-Powered Solo Walk, Shannon plans to arrive in Benalla on Saturday April 27, staying overnight & leaving for Wangaratta the next day. Shannon expects to arrive in Benalla at about 4.00pm and proceed to a Welcome to Benalla event at the John Cooper Hall at The Uniting Church, Carrier Street Benalla, opposite the Cole's Car Park. This event is open to the public. Shannon is collecting signatures on a petition which he will deliver to Parliament in Canberra. The walk will be low carbon, and community-powered, culminating in the delivery of the community’s messages to politicians in the capital. The petition will be available to sign. 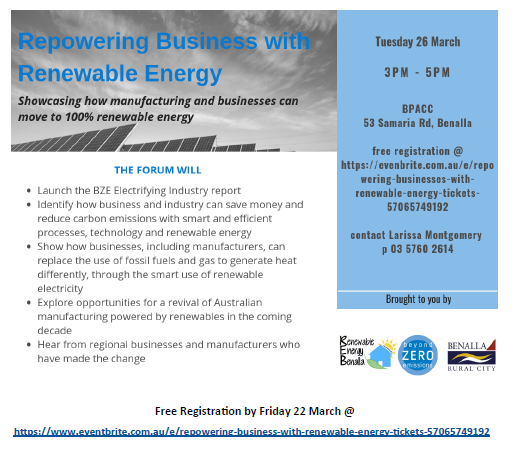 Shannon will tell us about his project then hand over to BSFG, Renewable Energy Benalla and other interested people to hear about and share local actions on climate change. After the meeting finger food and tea/coffee will be available providing an opportunity to talk about local climate change actions. Contact Peter 0418 135 330 for details. 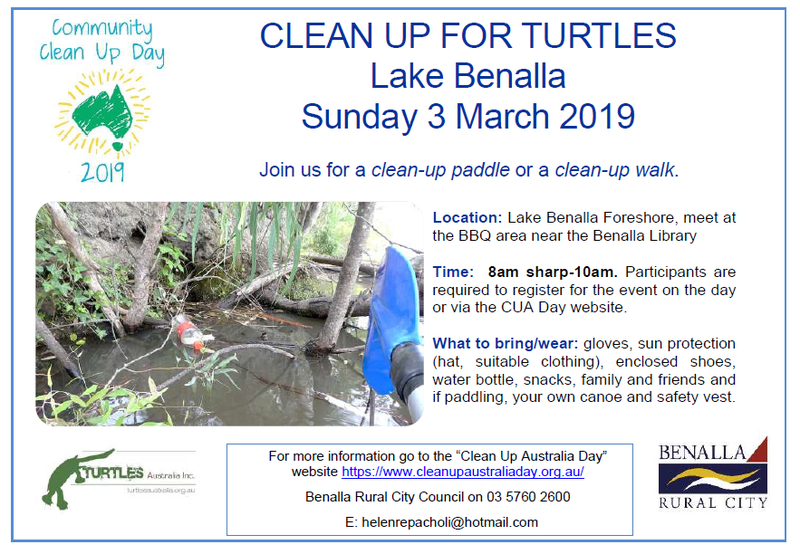 Join us for a clean-up paddle or a clean-up walk at Lake Benalla on Sunday 3 March 2019 from 8am sharp until 10am. The BSFG Committee had its first meeting for the year last Wednesday and there are a couple of resolutions to advise you about. Leading up to Christmas, December is a difficult time for people to attend General Meetings. January is also a time when people are often away. The Committee therefore resolved to have only five General Meetings per year. General Meetings will now be on the 4th Thursday of March, May, July, September and November. The Committee will continue to meet six times a year on the second Tuesday of February, April, June, August, October and December. The Committee has been discussing the replies we had to the Newsletter Survey and felt it was time to indicate a deadline for submission of articles for the next newsletter. Articles of about 200 words about an environmentally themed topic would be suitable for the Newsletter. Perhaps something you are personally interested in including actions you are taking to live more sustainably. Your thoughts about major environmental issues which are important to you. Are we dealing with these issues adequately? Politics gives plenty of scope for commentary on environmental issues. The deadline for the next Newsletter is Sunday February 17th. You can submit articles to Peter Maddock via email peter_maddock@iprimus.com.au Thank you to members who completed the Newsletter Survey. There is certainly interest from members in continuing with the Newsletter. 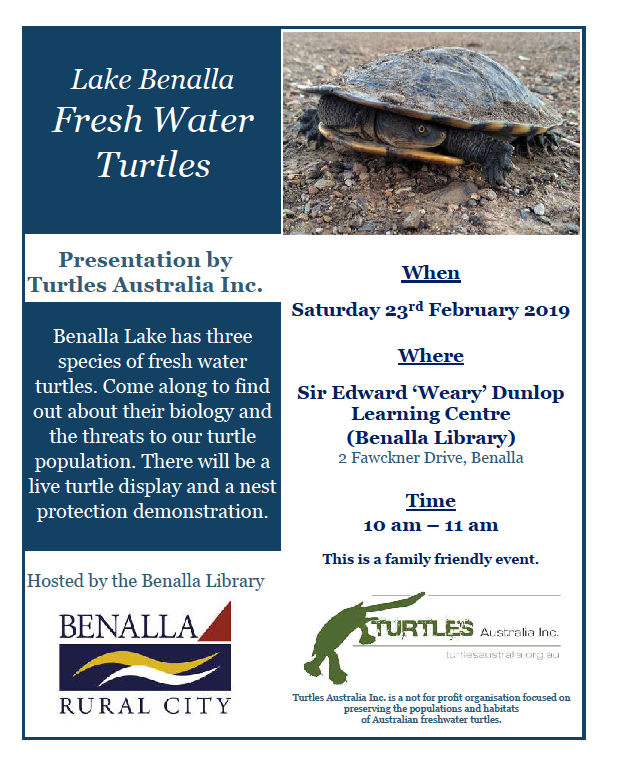 Come along to the Benalla Library at 10 am - 11 am on Saturday 23rd February 2019 and hear about the three species of fresh water turtles found in the Benalla Lake. 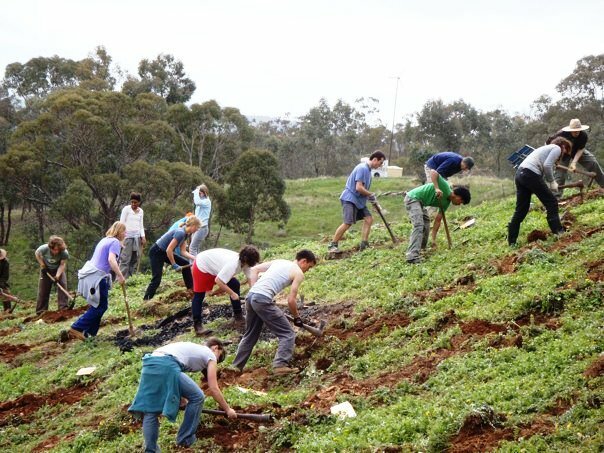 The Benalla Local Food Network is a new BSFG action group where local food growers, retailers, organisations and community members come together to supply the town with healthy food. It’s time for another local food network catch up! 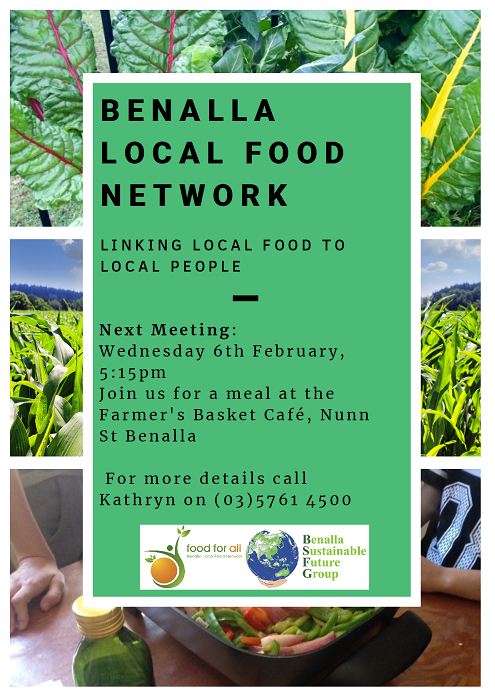 Join us on the Wednesday 6th February 5:15 at the Farmers Basket Café in Benalla (Nunn St). The Climate Council has been putting out some great stuff lately, including New Year's resolutions on climate change; the 8 biggest moments in climate change and 'talking energy' a summer bbq guide. It’s time for another local food network catch up! Join us on the Wednesday 7th November 5:15 at the Farmers Basket Café in Benalla (Nunn St). The newsletter released this week is the first we have attempted since John Lloyd retired as president at our AGM in June. We often heard from John the work required to put a Newsletter together and we now appreciate what is involved. One difficulty that John often mentioned was getting articles. I notice that the first edition was 4 pages while later editions have been 7 or 8 with one being 9 pages. This edition is 6 pages. Thank you to contributors to this edition and Ian Herbert for producing the newsletter. On behalf of the committee, current BSFG members and previous BSFG supporters I would like to thank John not only for his diligence in putting the newsletter together over many years, the first edition being on May 2012 but also for his role as president since the Benalla Sustainable Future Group was established in 2010 by local residents who were concerned about the issue of sustainability and the lack of action on climate change both locally and nationally. John has dedicated himself to many activities related to the environment, sustainability and climate change, promoting the activities of BSFG and contributing to its good standing in both Benalla and the wider community. John is also the convenor of the Benalla U3A group Towards a Sustainable Future. Now John is able to devote more time in leading the BSFG action group Renewable Energy Benalla which has the goal of Benalla becoming a zero net energy town by 2028. I know this role requires considerable work from both John and his group. Newsletter survey. At a recent Benalla Sustainable Future Group committee meeting we decided to review the publication of the BSFG Newsletter. Christine Holmes has therefor developed the attached survey to ascertain what you would like in the newsletter. Your input will be appreciated by the committee. The Benalla Food Co-op is continuing to be a wonderful, healthy organisation. With the four month absence of our long term coordinators, Peter and Christine Holmes and Tanya Walker, the committee took over the mammoth effort of running the food co-op. We were all amazed by the intense work load, which previously had largely fallen on such a small number of shoulders. We welcome Peter, Christine and Tanya back home and are determined that their load will be spread in the future. Thanks to Wendy Baker for taking over the job of paying the co-op bills in Peter’s absence. Recently I spent time showing our coop to people considering starting a food co-op themselves. The experience of watching the co-op from the sidelines and explaining how it runs, filled me with pride. The visitors commented on the diversity of our members and the very happy, engaged and friendly atmosphere of the co-op. We are delighted that our food coop continues to expand and fulfil our stated aims, which are ‘to encourage the responsible use of our earth’s resources, reduce packaging and excessive handling of food, support Australian growers where possible, reduce food miles and reduce food costs. ​It is 5:30am and I’m loading the last of my luggage in the boot of the Volvo. Dawn has not yet broken and I feel like a horse in the field as heavy streams of condensation surge from my mouth in the cold morning air. Last night I turned down going out and instead readied the 1988 blue beast for the journey ahead. I turn on the ignition and she roars to life, breaking the misty silence in the quiet suburban street. Once upon a time I would have rolled out on a Friday night straight after uni, but full-time work takes its toll and I much prefer the early morning starts these days. As I cruise through the town on my way to pick up the crew, I reflect on the week gone. I’ve been feeling good this term and I’m lucky to work in a country with rolling hills and native wildlife greeting me every day on my way into school. Yet, somehow, I need this; I need to be on the road on the early hours of the morning. I need to feel like I am contributing in a substantial way to the future of this planet. I need to know I can push my body so I feel muscles I never knew existed. I need to know there is something out there bigger than me. Some purpose to our existence beyond survival. The weekend will give me this. All of it. I turn into my mate’s street and the headlights swipe across the cityscape and something flashes ahead of me. She’s outside and ready, right on 6:00am. I greet Sam with a hug and we catch up while I help her load the luggage. Under the light of the street lamps, Mark emerges from the darkened sidewalk. He has never met Sam before, yet they click instantly. I don’t even pause to consider how incredible this is, the connection that always seems to occur between people committed to a cause beyond themselves. Guess I am just used to it now. The Volvo hums as it reaches a comfortable speed on the freeway. Our journey has begun. The destination is only two hours from the city, but the time results in shared music, philosophical conversation and appreciation for our surroundings. As we stop in the service station, I happily indulge in a healthy breakfast burrito, a novelty in roadside cuisine but fast becoming the norm. This is one part of the trip that has changed since I’d been in the past; I welcome it, though. After morning coffee, the smiles appear, and we embrace the rays of the morning sun through the windscreen. The chat becomes more exuberant and the music more upbeat. The town sign greets me, and I am pleased to see the entrance has not changed. As we cross the bridge I relax into the day, another year, another great weekend. Turn left at the KFC, my inner voice reminds me, though it is no longer needed. As we pull in to the scout hall, the advance party greets us with cereal and delighted smiles. Lewis, Bianca and Adele seem fresh and ready. I look around to suss out the rest of the crew that has come this year. Good, it seems the university students are still at it, and the Monash Biological Society has turned up. The legacy continues and I’m proud of them. I head straight to the kitchen and pour myself a cuppa. Inevitably, there is someone there to chat with. In such close quarters you are forced to get to know people, and I love it. Mainly because everyone is happy and open, here. I rock up to the event tent and sign in, admiring the gorgeous scenery around us. Today we’re in Winton Wetlands and we change place according to the year but are always embraced by the beauty that is country Victoria. The system is still the same, the girls behind the fold-up table prefer it that way. Hard copies are easier to maintain in the field. We kit up, it’s a fresh morning and the winds are picking up. Today’s safety brief goes through the conditions and the big man informs us that our healthy and safety is their number one priority. Should the slightest hint of rain come we are to head into the cars and take shelter. It is too windy to risk being out there in the rain. Of course the briefing also includes a few terrible jokes and a warm thank you to everyone who is attending. This site is special, too; we’re working on land that might have cultural artifacts of indigenous and European heritage. We are instructed to leave them should we find any. I make sure to grab a mattock and head out with the mattock crew. “Aptly named Matt” is introduced as the new Head of the Mattock Team. This care and attention to detail draws me in every time. We’re working in rows of 3 and will be zig-zagging up the mountain, following a rip line of a tractor. The tractor has dug the ground in lines, so the roots can penetrate deep into the ground. This year the rip line is shallower to lower the risk of damaging artifacts. Each plant has had a small area around it sprayed and we use the mattocks to scalp the land of any leftover weed seed. As I dig my blade into the ground the impact travels up my arm, awakening old muscle memory. I smile as I get stuck into the area lifting, striking and pulling the dirt toward me. I look around as more holes are dug. It is a good turn out this weekend. Over 40 people, and we’re all keen. Most of the crew are planting, which is the most time-consuming part. Lewis and Sam pass me furiously chatting politics; they always bring interesting conversation. A few people join in, but I don’t indulge. This is the first weekend I’ve come out and I intend to wear myself to the bone. The day warms up and we work in the glorious sunshine. As we reach the top of the hill I look out at the lush greenery, marveling at its beauty. Despite having been bending over and mattocking for the last couple of hours, I’m not tired. The fresh country air and sense of peace is invigorating, as is the cold wind that lashes my jacket. I’m glad that I have prepared well. One year I didn’t. If it weren’t for a ex-Biological Society president and avid tree-planting advocate, Ben, I would have suffered during a particularly rainy weekend. These are the memories that bring me back year after year. Select experiences that only ever occur when you’ve removed yourself from all other distractions, and embrace special moments with a few people. ​Lunch is called and we trek down to the camp where Chris, Helen and Shiaan have prepared a fire. This year it is a gas fire, as the cultural heritage site prohibits the usual open firepit. Despite this, the tea tastes just as good – and the fruit cake just as sweet. As I gaze across the wetlands a tall shape appears in the corner of my eye. I turn around and there, wearing safety attire and an equally vibrant beanie, is the giant that gave the briefing at the start of the day. He turns and I give him a big smile. “Chanaka.” The warmth and radiance leaps forward from Andie as he goes to give me a handshake. Both him and his predecessor Ray give off this incredible energy, where you feel like you are one of the most important people on this planet. Both are great men, inspiring the younger generation not only through tree planting, but by serving the community as a foster parent and teacher, respectively. We exchange a few words, but I let him get back to it. The man is busy on tree planting days. 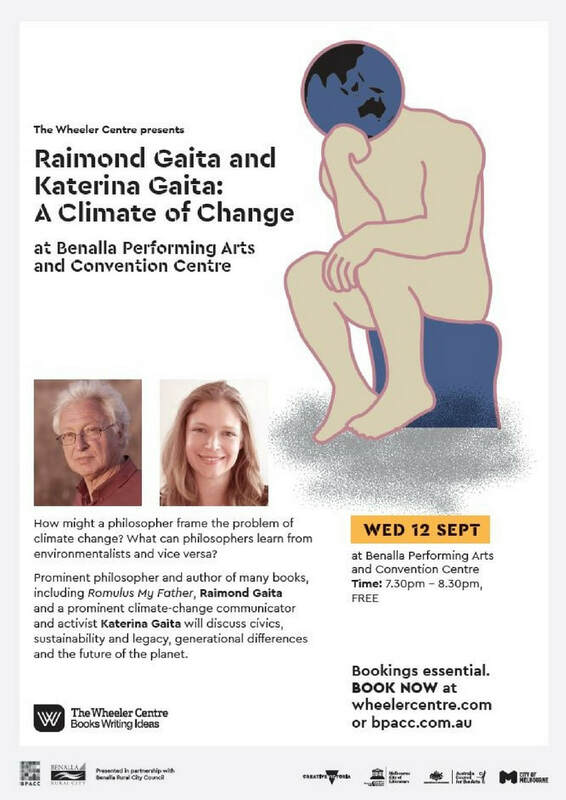 The next General Meeting of Benalla Sustainable Future Group will be held at the Benalla Uniting Church on Thursday the 25th of October from 7.30pm until 9.30pm. For this meeting we are screening the short film Takayna 2018 from Patagonia Films. Takayna/Tarkine in north-western Tasmania is home to one of the last tracts of old-growth rainforest in the world, yet it’s currently at the mercy of destructive extraction industries, including logging and mining. This documentary unpacks the complexities of modern conservation and challenges us to consider the importance of our last wild places. The film shows Nicole Anderson a rural doctor in Smithton who runs deep into the Tarkine reporting on the hidden logging activities in the region. Bob Brown appears in the film and activities around the Franklin River are shown. A short interview with a former timber worker highlights how small communities relying on extractive industries for employment may feel threatened by efforts to protect the Tarkine, particularly when they feel they are sustainably harvesting old growth forests. Note that Takayna has some coarse language. We look forward to seeing you at the meeting. Tea, coffee and biscuits will be available after the film.